The Real Housewives of New Jersey and recent Celebrity Apprentice star Teresa Giudice has once again topped The New York Times Best Seller list with her latest cookbook, Fabulicious! 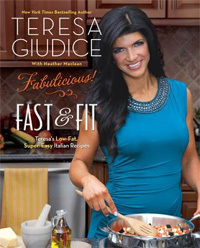 : Fast & Fit: Teresa’s Low-Fat, Super-Easy Italian Recipes. To promote the newest addition to her Fabulicious line of cookbooks, Giudice recently appeared at the University of Pennsylvania Bookstore, in Philadelphia, Pennsylvania and DePaul University Bookstore in Chicago, Illinois. At each location, hundreds of enthusiastic and loyal fans were beyond excited to receive an autographed copy of her cookbook and pose for a photograph with the Bravo TV reality star.